The Stanley Cup Playoffs are….. 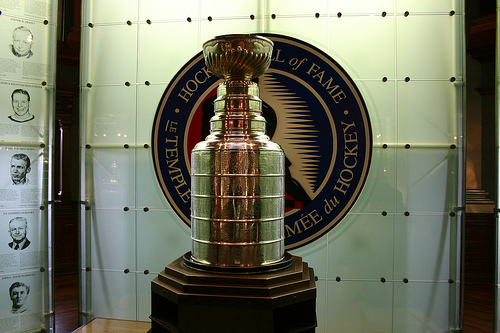 The Stanley Cup Playoffs are …………..
– physically and mentally grueling. – what the regular season is played for. – late nights at the game, or in front of the television. – where heroes are made. – when overtime means something. – sell-outs on a nightly basis. – where mistakes equal goals. – where officiating changes from the regular season. – when players sometimes lose their minds. – where national television broadcasts actually have pre and post game shows. – a time for white outs, rats, octopus, and green guys come out. – where experienced veterans are so important. – a time for friends to gather in front of the television. – where tears of happiness and sadness are shed. – a time to make your power plays count. – a time when you not see a shoot-out. Yeah! – where unknowns turn into stars. – often dirty, and always gritty. – where defense takes on a new importance. – a time to drive the net. – where heroes turn to zeros. – 63 nights of intense hockey. – what the sport is all about. Is there anything better than the Stanley Cup Playoffs!